Edinburgh, home to the Scottish Parliament, is on the itinerary of many visitors to Scotland. This brand new edition retains the delightful water-colour mapping, with individual paintings of all the main sights and landmarks. Popular areas at larger scale, hundreds of shops, restaurants, cafes and bars, comprehensive travel information and index. 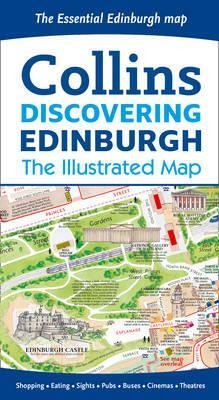 Includes: Large-scale plans of the Castle, Royal Mile, Botanic Gardens, Leith and Newington. Shop-by-shop street maps of Princes Street, George Street, Victoria Street and the Grassmarket. Railway stations, bus routes, taxi ranks and car parks. Historical and contemporary anecdotes. Suggestions for day trips out of the city. Comprehensive index. AREA OF COVERAGE Covers the centre of Edinburgh from Inverleith Park in the north to The Meadows in the south, and from the Scottish National Gallery of Modern Art in the west to the Palace of Holyroodhouse in the east.